I might be geeking out a little over this free set of commercial use monogram turkey cut files. I mean you guys...is this not the best Freebie Friday ever?! This adorable set of 8 Thanksgiving turkey monogram SVG files (also available as DXF, PNG, and more file type) is from Cuttable Designs and it's free for Silhouette School members. The possibilities on how to use these free Silhouette cut files these are endless! You could use them as print and cuts for your Thanksgiving table settings...think napkin rings or name place holder. You could print them as stickers or create a shirt for yourself or your kids! By the way if you're cutting one of these turkey cut files on heat transfer vinyl, separate the pieces on your cutting mat (the select by color tool is very helpful here) and cut them all at once on your cutting mat! Reveal the grid numbers on your cutting mat and in Silhouette Studio to correctly place your HTV pieces on the mat. TIP: Subtract out the white areas so you don't have to cut them and use the shirt to show through instead! 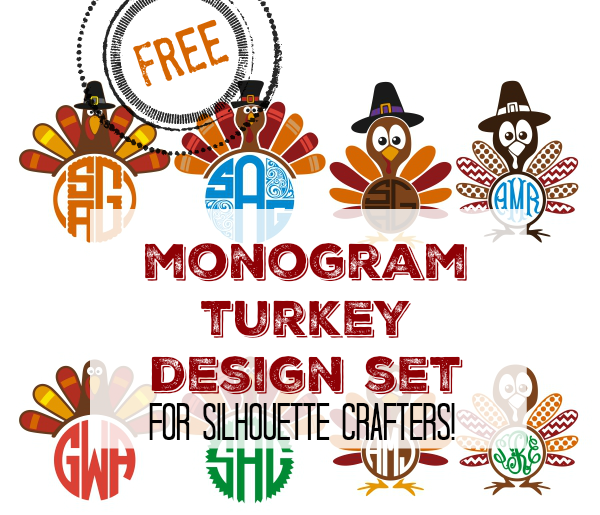 Alright are you ready to download the full free set of monogram turkeys from Cuttable Designs? Head on over and grab them! Don't forget these can be used for personal or commercial use! I had the same issue. This works. Melissa: THANK YOU!!!! (for ALL you do!) Not only have you found and filled a niche, you have done it excellently! Thank you so much. That is so sweet of you. I guess you have to have an account at Apex to get the designs? Apparently I already have one, but don't know my password. I've requested a reset, but have not gotten the promised email from Apex. Same here on password really word love this design. why do we have to get thing though Apex now? Having never done monogramming, I'm wondering how to do it? Do I just purchase a monogram font and will the specific instructions be with that font? I new to Silhouette. Ive downloaded the file, now what? Is your picture above of your studio work space (where you are showing the select by color) for the cameo 2 or 3? I noticed you have some different buttons on yours than I have on mine. How do you change the initials to the initials that you need?